1:30-3pm—Children’s Summer Cooking Class hosted by VELA Farmers Market. This is a fun, hands-on summer cooking class for children and their families. Come by to enjoy preparing healthy and easy dishes perfect for the summer heat! Continues every Thursday through July 26 at the Health Net Community Solutions Center: 5047 East Whittier Blvd., East L.A. 90022. For more information, call (877) 698-7662. 6-10pm—Parks After Dark at City Terrace Park. Program runs Thursdays, Friday and Saturdays (6-9pm) through Aug. 25. Includes sports, movies, concerts, aquatics and more for the entire family. Park is located at 126 N. Hazard Dr., LA 90063. For more information, call (323) 260-2371. 6-8pm—Friday Movie Night and Ford Theater JAM Session at the East LA Civic Center: 4801 E. Third St, LA 90022. Movie at Sundown following Hip-hop Dance session. For more information, call (323) 260-2360. Take the Metro Gold Line. 3pm—The Arroyo Seco Library in Highland Park hosts a free Red Cross Disaster Preparedness Presentation. Learn how you can be ready for any emergency. Everyone is welcome. The library is located at 6145 N. Figueroa St. LA 90042. For more information, call (323) 255-0537. 3pm—Montebello Library Adult Reading Summer Book Reading Program presents signing/book talk with Peter Ford, son of the actor Glenn Ford, and author of the new biography: Glenn Ford: A Life. Includes a video presentation and question/answer session. The Montebello Library is located at 1550 W. Beverly Blvd., Montebello 90640. For more information, contact Dennis McCargar at (323) 722-655. 4pm—ASOSAL (kids) Free Concert & Soccer Tournament at the Levitt Pavilion at MacArthur Park, near the intersection of West 6th Street & S. Park View Street across from the Park Plaza Hotel. Take the Metro Red Line to the MacArthur Park Station. For more information, go to www.levittla.org or call (213) 384-5701. 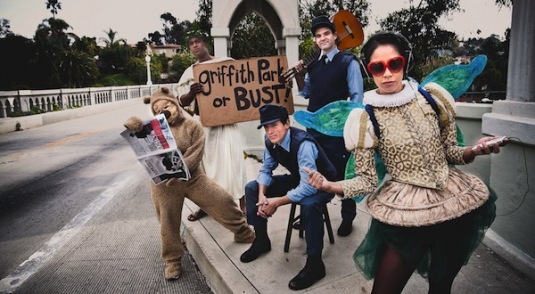 Sunday, July 8, 5pm—Pre-show Bilingual Workshop at Griffith Park Free Shakespeare Festival –“Players in the Park/Jugamos en el Parque.” Production: “The Winter’s Tale.” Participation is free, but reservations recommended for this interactive family workshop, call (818) 710-6306. Show starts at 7pm. No seating; bring a blanket or low-back chair to sit on. Location: The Old Zoo in Griffith Park, near 4730 Crystal Springs Drive. The Commerce Public Library will host a free Pottery Workshop on July 12 at the Central Library. The library is located at 5655 Jillson St, Commerce, 90040. For more information, call (323) 722-6660 or email referencel@ci.commerce.ca.us. Are you Registered to Vote? You can now register to vote at any of Arroyo Vista Family Health Center’s clinic sites. For more information call (323) 987-2000, ask for Irene or Julio. Sign up now for Annual AltaMed Run for Your Life! 5k Run/Walk Race on Aug. 18 at East Los Angeles College. Registration at 7am; Kids’ Races at 8am; Main Race/Walk at 8:30 am. Event includes at Health & Wellness Fair from 7am to Noon. For more information, visit www.AltaMed.org. Submit an event or announcement to the Community Calendar: email calendar@egpnews.com. All submissions subject to space availability. Paid advertising available; for more information, email advertise@egpnews.com or call (323) 341-7970. The Asian Pacific American Labor Alliance (APALA) and the United Food and Commercial Workers, Local 770 announced Tuesday they jointly filed a lawsuit against the L.A. City Department of Building & Safety for failing to inform the public of its decision to allow a Walmart store in Chinatown to proceed without environmental review. The lawsuit also seeks to stop the construction at the store. Earlier this week, thousands of union members and labor activists held a march and rally in what was being billed as the largest anti-Walmart demonstration since the company opened its first store in 1962. 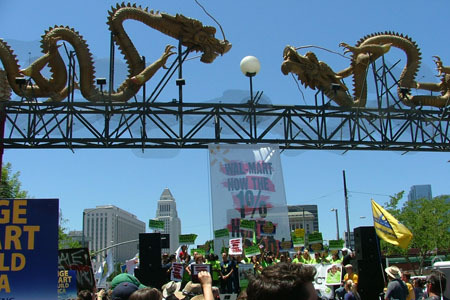 On Saturday, thousands of demonstrators marched from Los Angeles State Historic Park to the construction site of a Walmart Neighborhood Market on the edge of Chinatown scheduled to open in 2013. Rage Against the Machine guitarist Tom Morello and folk-rocker Ben Harper, participated in the protest. Construction began last week on the 33,000 square-foot grocery store that will employ 65 people on the first floor of an apartment building on the northwest corner of Cesar E. Chavez Avenue and Grand Avenue. A full-size Walmart ranges in size from about 51,000 square feet up to about 260,000 square feet. 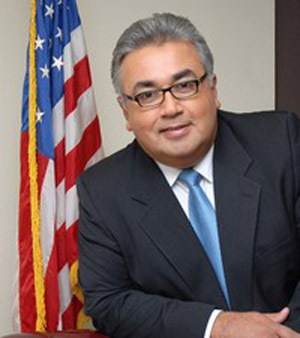 City Councilman Ed Reyes, who represents the area, tried in March to put the project on hold in the face of opposition, but the chain received final approval for the store the day before the council voted to block the project. Opponents of the store argue that Walmart, the world’s largest private company with 1.4 million employees in the U.S., abuses the rights of its workers to unionize, pays low wages and provides inadequate health benefits. Walmart officials dispute the claims, saying that the chain’s wages and benefits are competitive or better than comparable retailers. “It’s not us targeting Walmart. It’s Walmart targeting Los Angeles,” said Maria Elena Durazo, executive secretary treasurer of the Los Angeles County Federation of Labor, AFL-CIO, which helped to organize the protest. Durazo accused the chain of not paying a living wage. A 2004 study by UC Berkeley’s Labor Center found that Walmart employees cost California taxpayers about $86 million per year in health care and other public assistance costs. One of the study’s authors, UC Berkeley Labor Center Chair Ken Jacobs, said the problem is the same today and far too many Walmart employees rely on public assistance for food and health care. Kent Wong, director of the UCLA Center for Labor Research and Education, said Walmart has earned the ire of labor unions because of its “aggressive” anti-union position. 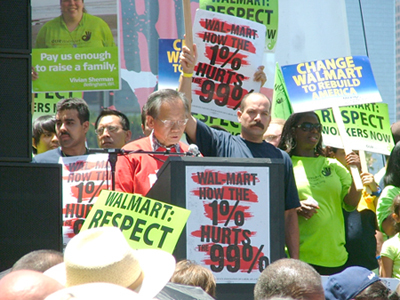 Wong pointed to Walmart’s decision in 2005 to layoff 200 workers and close a store in Canada after the employees sought to unionize. In another case in 2000, butchers at a Texas Walmart sought to unionize. The company eliminated the department and switched to packaged meats. Wong said the chain has also gained opposition because of the political leanings of the company’s founding family, the Waltons. “Many of the Walmart heirs are aggressive in contributing to right-wing causes,” Wong said. Walmart Senior Director for Community Affairs Steven Restivo defended the company and said the Chinatown location has many supporters, including in the Chinese American business community. “Looking at all we offer, our associates just don’t seem to feel union membership would be a better deal,” Restivo said, responding to questions about the company’s efforts to block collective bargaining. Restivo disputed claims that the company does not provide adequate health benefits. He said more than one million of the company’s employees are on a company health plan, which costs about $15 per pay period for comprehensive coverage. The company also offers to match employees’ contributions to a 401(k) up to 6 percent of an employee’s salary. The company also offers its employees 10 percent discounts on most products, Restivo said. “We spend a lot of time communicating with our associates and the overwhelming majority of them tell us they have a rewarding experience working at Walmart,” Restivo said. “Walmart is a retailer that is concerned about its image and very concerned about the way a demonstration like this might resonate with public institutions that have to vote to approve something like this (in the future),” Shaiken said. 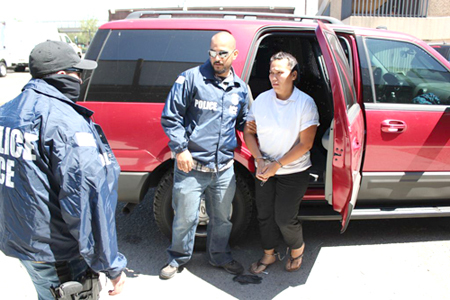 A woman suspected of being a high-level operative for an extremely violent Michoacan-based cartel was arrested in El Monte and handed over to Mexican authorities, federal authorities announced Tuesday. Anel Violeta Noriega Rios, 27, was arrested June 27 at her El Monte home by U.S. Immigration and Customs Enforcement officers and other members of the U.S. Marshals Pacific Southwest Regional Fugitive Task Force. Ana Violeta Noriega Rios is alleged to be a high-ranking member of a Mexican drug cartel. Two days later, she was transported to the U.S.-Mexico border and turned over to Mexican authorities under tight security, according to ICE. A 64-page criminal warrant issued in the Mexican state of Tamaulipas in January 2010 charges Noriega with ongoing involvement in organized crime and drug trafficking as a member of a gang called La Familia. Mexican authorities allege that she was one of the underworld group’s main U.S.-based lieutenants, helping oversee its methamphetamine distribution in California and Washington state. Rooted in western Mexico, La Familia engages in narcotics trafficking, kidnapping, extortion and other highly violent criminal activities, according to U.S. authorities. In addition to distributing cocaine and marijuana, the gang also is believed to be heavily involved in producing methamphetamine for export to the United States. In 2004 and 2005, Noriega, who has no criminal convictions in the United States, was arrested and repatriated to Mexico five times by U.S. Customs and Border Protection agents. Un ex funcionario de la ciudad de Vernon, Eric T. Fresch, cuyos tratos financieros fueron el enfoque de una auditoria por el estado, fue descubierto muerto el jueves por la noche en un parque estatal en el norte de California. Su cuerpo fue encontrado en la orilla del mar, en una playa rocosa al este de Angel Island dijo Ed Lynch, el jefe de batallón del departamento de bomberos de Tiburón, una comunidad en el Condado de Marín. Fresch, de 58 años de edad, fue residente de Tiburón. Los oficiales del parque el jueves recibieron un reporte que indicaba que Fresch no había bordado dos transbordadores programados de regreso a Tiburón. La superintendente del parque, Amy Brees, dijo que ellos llevaron a cabo una búsqueda y a las 6 pm localizaron la bicicleta de Fresch y a continuación su cuerpo. La noticia de la muerte de Fresch salió al mismo tiempo que se dio a saber que los auditores del estado investigaban las financias de Vernon. En un reporte publicado el mismo día, los auditores dijeron que Fresch no había respondido a numerosas peticiones por información. El senador Kevin De León, quien inició una investigación criminal contra Fresch ese mismo jueves, expresó en una declaración “sus condolencias profundas y sus simpatías sinceras a la familia y la esposa [de Fresch]” cuando se enteró de la muerte. El pasado noviembre, Fresch anuncio su jubilación pero continuó como asesor para la ciudad hasta mayo. Él estuvo involucrado en muchos de los asuntos financieros grandes de la ciudad, especialmente con los tratos del departamento de luz y energía, como la compra de un suministro de gas natural prepagado para 15 años para la planta de energía. En una reunión del consejo municipal de Vernon, los oficiales de la ciudad admitieron que la compra del gas natural fue un trato malo y que el valor del gas natural ha bajado significantemente desde que lo compraron. Los auditores del estado dijeron que la ciudad vendió una planta de energía recién construida solo dos años después que compraron el suministro de 15 años de gas natural. Un hombre de negocios en la ciudad cuyas tarifas de electricidad han aumentado en los últimos años dijo en la reunión a los oficiales de la ciudad que “Si nosotros fuéramos sus accionistas, los despidiéramos.” Otros amenazaron mudar parte o toda de sus operaciones a otro lugar. Los oficiales de la ciudad antes alababan a Fresch por su trabajo financiero con la ciudad empresarial, pero la última semana—en respuesta a las indignaciones de los miembros de la comunidad de negocios a raíz de los aumentos en las tarifas de electricidad y un propuesto impuesto sobre la utilidad—ellos admitieron que los tratos, como la compra del gas natural, contribuyeron a la situación en la cual se encuentra la ciudad. El candidato del Partido Revolucionario Institucional (PRI), Enrique Peña Nieto, ha ganado las elecciones mexicanas realizadas el pasado domingo, 1 de julio, según datos provisionales dados a conocer por las autoridades electorales, una victoria virtual que el candidato de la izquierda, Andrés Manuel López Obrador, no ha querido reconocer. Tal y como pronosticaban los sondeos antes de las elecciones, el candidato del PRI ha logrado una cómoda victoria frente a sus rivales y a partir del próximo 1 de diciembre sucederá a Felipe Calderón en la presidencia de México. Según una muestra estadística del Instituto Federal Electoral (IFE) con los datos de cerca de 7.500 actas de votación, y a la espera de los resultados finales, Peña Nieto obtuvo entre el 37,93 y el 38,55 por ciento de los votos, de acuerdo la información que dio el presidente del organismo electoral, Leonardo Valdés. 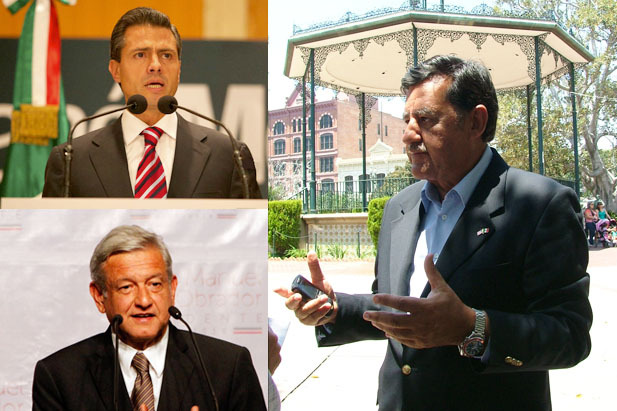 (Arriba) Enrique Peña Nieto, (Abajo) Andrés Manuel López Obrador, (Derecha) Xavier Rivas y otros ciudadanos se reunieron en la Placita Olvera el lunes para celebrar la victoria del candidato del PRI y pedir a los ciudadanos mexicanos a unirse y trabajar juntos bajo la presidencia de Peña Nieto. “Asumo con emoción, con gran compromiso y plena responsabilidad el mandato que los mexicanos me han encomendado”, dijo Peña Nieto en un discurso ante sus seguidores, que lo recibieron al grito de “presidente”. Peña Nieto agregó que hay que dejar atrás las tensiones y diferencias y “propiciar y alentar la reconciliación nacional”. “Más allá de tendencias o preferencias personales hay algo que nos une a todos, nuestro amor por México”, apuntó Peña Nieto, quien reiteró que frente al crimen organizado no habrá “ni pacto ni tregua”. Pese a que el IFE indicó que los datos que dio a conocer tienen un margen de error de apenas 0,5 por ciento, el candidato de la izquierda no quiso reconocer la virtual victoria de Peña, ni su propia derrota. López Obrador afirmó que los datos de las elecciones presidenciales dados a conocer hasta ahora no coinciden con los suyos (que no precisó) y que esperará hasta conocer los resultados finales. “Aún no está dicha la última palabra”, afirmó López Obrador, dirigente del Partido de la Revolución Democrática (PRD). “Es fundamental tener un recuento de todos los datos (…) Vamos a esperar a tener toda la información”, agregó. El candidato de la izquierda, que tampoco reconoció su derrota en las elecciones presidenciales de 2006, dio su mensaje segundos después de que los datos del IFE indicaran que había perdido en los comicios. De acuerdo con los datos del organismo electoral, el aspirante de la izquierda mexicana obtuvo entre el 30,9 y el 31,86 por ciento de los sufragios. En tercer lugar quedó la candidata del gobernante Partido Acción Nacional (PAN), Josefina Vázquez Mota, que logró entre el 25,10 y el 26,03 por ciento de los votos. La primera en reconocer su derrota fue Vázquez Mota, quien a las 20.30 hora local (01.30 GMT) admitió que la tendencia de voto reflejada en algunas encuestas a pie de urna indicaba que había perdido las elecciones. En un mensaje a sus partidarios, avisó de que su partido va a estar “vigilante” con el vencedor. “Estaré vigilante con todo el poder que me dan los millones de votos de que se cristalicen las reformas estructurales que requiere el país y de impedir el retorno del autoritarismo, el imperio de la corrupción, de la impunidad y de la rendición frente al crimen organizado”, puntualizó. El presidente del IFE, en su mensaje, señaló que la participación en los comicios fue superior al 62 por ciento y dijo que votaron más de 49 millones de personas. “La de hoy es la elección que más votos se ha recibido en la historia de México”, añadió. Por otra parte, fuentes del IFE indicaron que más de mil ciudadanos seleccionados al azar realizaron el escrutinio y cómputo de los votos contenidos en 40.737 sobres postales enviados por electores mexicanos desde 91 países, 72 % por ciento de ellos desde Estados Unidos. El presidente de la Comisión Temporal del Voto de los Mexicanos Residentes en el Extranjero del IFE, Francisco Guerrero, señaló que estaban habilitados para sufragar de esta forma 59.044 mexicanos, lo que significa que alrededor de 69 % de ellos ejercieron su derecho. Asimismo, el número de sobres recibidos es 23 % superior al registrado en las elecciones federales de 2006, cuando los mexicanos que residen fuera de su país pudieron ejercer por primera vez su derecho a votar por presidente de la República, dijeron las fuentes. Unos 79,5 millones de mexicanos fueron convocados ayer a las urnas para elegir nuevo presidente, los 500 diputados y 128 senadores que integrarán el Congreso, así como 925 alcaldes, seis gobernadores estatales y el Jefe de Gobierno del Distrito Federal. Muy pocos de los aproximadamente tres millones de ciudadanos mexicanos habilitados para votar y que residen en Estados Unidos emitieron su sufragio para las elecciones presidenciales de su país, según indicaron el lunes fuentes diplomáticas y gubernamentales. “Para cuando venció el plazo de registro de votantes que estén en el exterior se habían anotado 59.044 ciudadanos en noventa y un países y por lo menos 47.000 enviaron su voto”, dijo a Efe Ricardo Alday, portavoz de la embajada de México en Washington. “Se calcula que alrededor del 80 por ciento de esos votos desde el exterior provino de los ciudadanos mexicanos en Estados Unidos”, añadió. Esto indica un contingente de alrededor de 32.600 votos de mexicanos residentes en Estados Unidos. Un estudio del Centro Pew Hispano indicó recientemente que solo el 31 por ciento de los mexicanos en Estados Unidos tenía la credencial válida para votar, y esto representa un contingente de unos tres millones de posibles sufragios. De acuerdo con las cifras del Programa de Resultados Electorales Preliminares, del Instituto Federal Electoral de México, el 42,1 % de los votantes en el exterior dio su voto para la candidata del Partido de Acción Nacional (PAN), Josefina Vázquez Mota. El 38,9 % de los votantes mexicanos en el exterior volcó su preferencia hacia el candidato de la Coalición Movimiento Progresista, Andrés Manuel López Obrador; y el 15,6 % dio su voto a Enrique Peña Nieto, del Partido Revolucionario Institucional (PRI). El cierre de una planta de energía en San Diego podrá dar lugar a apagones este verano, especialmente si la región del Sur de California sufre de condiciones climáticas extremas o emergencias, informan los oficiales del suministro eléctrico. Los oficiales de Southern California Edison dicen que eventos como olas de calor e incendios silvestres podrían causar apagones imprevistos y planeados, especialmente ya que se cerró la planta de energía nuclear de San Onofre debido a una fuga detectada a principios de este año en unas de sus unidades generadoras. “Nosotros creemos que tememos suficientes recursos para este verano. Sin embargo, si otra planta de energía se cierra en algún otro lugar por cualquier razón, o si una línea de transmisión se cae en algún lugar, podríamos tener problemas en el sistema,” dijo la portavoz de Southern California Edison Verónica Gutiérrez. La planta de energía nuclear de San Onofre de 2.200 megavatios genera 19 por ciento de la energía usada por los clientes del Sur de California y ayuda a mantener estable el suministro de energía de la región. En enero los operadores de la planta de energía detectaron una fuga en unas de las unidades. Ellos piensan que fue el resultado de vibraciones causadas por desgastes que están fuera de la vista y “tan temprano en la vida de esta unidad,” dijo Gutiérrez. Un cierre inmediato fue ordenado y hubo planes iniciales para reabrir la planta de energía este verano. Pero ahora los oficiales anticipan que las operaciones no se iniciarán hasta a fines de agosto. “Todavía estamos averiguando que paso ahí…la seguridad es lo más importante y la seguridad no tiene calendario. Queremos asegurarnos de que comenzaremos a operar la planta de nuevo solo cuando estemos satisfechos y cuando la NRC [la Comisión Regulatoria Nuclear] este satisfecha,” dijo Gutiérrez. Para evitar un apagón masivo, los oficiales podrían programar apagones, rotándolos en partes iguales entre las diferentes zonas del Sur de California, pero todavía puede haber apagones imprevistos, especialmente a las horas pico. “Hay tiempos durante el día caliente del verano cuando es el punto más alto de consumo de energía…es este tiempo más caliente cuando queremos que las personas conserven luz,” dijo Gutiérrez. Para prevenir los apagones y reducir el impacto del cierre de la planta San Onofre, especialmente en los meses de verano, la empresa eléctrica esta ofreciendo incentivos y programas para animar al público a conservar la energía. Por su parte, Southern California Edison está tratando de compensar por la pérdida de la planta San Onofre con reabrir dos unidades generadoras en Huntington Beach y acelerar la actualización de una línea de transmisión que ayudará a facilitar la disponibilidad de energía para el condado de Orange y San Diego, las zonas más afectadas por el cierre. Sin embargo, las unidades de Huntinton Beach solo se podrán mantener en operación por un par de meses hasta que se tengan que cerrar otra vez. Aunque los apagones son malas noticias para los usuarios del suministro, ellos podrán utilizar esta oportunidad para reducir los gastos de energía y tomar ventaja de reembolsos e incentivos al reciclar refrigeradores viejos, comprar refrigeradores que ahorran energía, reemplazar sus viejos unidades de aire acondicionado con unos mas eficientes, y actualizar las pompas de las piscinas. Incluso, al reducir el uso de energía entre 2pm-6pm en un día “Save Power,” los usuarios podrán ahorrar hasta $100 en sus facturas de luz. Los oficiales también piden a los usuarios que conservan la energía en los días “Flex Alert,” que son emitidos por el estado. Se encuentran aun más maneras de mejorar el uso de luz a través del nuevo sistema interactivo SmartConnect de la compañía que permite a los usuarios a ver estadísticas y datos sobre cuanta energía usan, cuando se la usan, y cuales electrodomésticos o equipos electrónicos gastan más energía. El sistema les ayudará a los usuarios a administrar y no perder la vista de su consumo de energía. Incluso, se anima aquellos que descubran estas incentivas y programas a informar a sus parientes y amigos que no tienen acceso a la Internet o las computadoras. En caso de apagones, los oficiales de Southern California Edison están distribuyendo consejos de seguridad, especialmente por el recién acontecimiento de tragedias por las tormentas de viento en las cuales murieron tres miembros de una familia en San Bernardino por un cable de luz que se rompió y chocó en su traspatio. No importa como se vea el cable de corriente, es mejor asumir que esta viva y que no se debe tocar, dicen los oficiales. También recomiendan a las personas que tienen condiciones medicas y que requieren el uso de aire acondicionado u otro equipo electrónico, que se registren a la lista “médica inicial” (medical baseline) o “cuidado crítico” (critical care) para que los apagones programados no incluyan sus hogares. Hospitales o personas con equipos médicos en sus casas son requeridos a tener generadores de luz en caso de apagones imprevistos. Para más información sobre los incentivos y programas de Southern California Edison, visite a http://www.sce.com/SummerSave. Miles de trabajadores sindicalizados y activistas de labor realizaron una marcha y mitin el sábado, 30 de junio, en lo que se esta llamando la más grande manifestación contra Walmart desde que la compañía abrió su primera tienda en el año 1962. La Federación de Labor del Condado de Los Ángeles anticipó que 10.000 manifestantes marcharían desde Los Ángeles State Historic Park hasta el nuevo sitio de un “Walmart Neighborhood Market” a la orilla del Barrio Chino (Chinatown en inglés). El supermercado de Walmart esta programado a abrir en 2013. La construcción para la tienda de comestibles empezó la semana pasada. El supermercado de tamaño mediano, será de 33.000 pies cuadrados, y contratará 65 empleados. La tienda estará en el primer piso de un edificio de apartamentos ubicado en la esquina norte-oeste de la avenida Cesar Chávez y la avenida Grand en Los Ángeles. Un Walmart de tamaño completo mide de 51.000 a 260.000 pies cuadrados. Debido a la oposición, el concejal de Los Ángeles Ed Reyes, quien representa la zona, trató de detener el proyecto en marzo, pero la cadena recibió aprobación final para la tienda antes que el concilio votara para bloquear el proyecto. Los opuestos a la tienda discuten que Walmart—la compañía privada más grande del mundo con 1.4 millones de empleados en los Estados Unidos—abusa del derecho de sus empleados a formar un sindicato, paga salarios muy bajos, y ofrece beneficios de salud inadecuados. Los oficiales de Walmart impugnan las alegaciones diciendo que los salarios y los beneficios de la cadena son competitivos o mejores que otras tiendas comparables. “No somos nosotros contra Walmart. Es Walmart contra Los Ángeles,” dijo María Elena Durazo, la secretaria tesorera ejecutiva de la Federación de Labor de Los Ángeles, AFL-CIO, quién ayudó organizar la protesta. Durazo acusó a la cadena de no pagar salarios dignos. Un estudio hecho en el 2004 por el Centro de Labor de la universidad UC Berkeley descubrió que los empleados de Walmart son una carga para los contribuyentes de impuestos de California y cada año utilizan unos $86 millones en costos de cuidado médico y otros costos de asistencia pública. Uno de los autores del estudio, el presidente del Centro de Labor de UC Berkeley Ken Jacobs, dijo que el problema sigue igual hoy en día y que demasiados empleados de Walmart dependen en asistencia pública para comprar comida y tener cuidado médico. Kent Wong, el director del Centro del Estudio de Labor y Educación de UCLA, dijo que Walmart ha ganado la ira de los sindicatos por su posición “agresiva” contra los sindicatos. Wong se refirió a la decisión de Walmart en 2005 a despedir a 200 empleados y cerrar una tienda en Canada porque los empleados querían sindicalizarse. En otro caso en el año 2000, hubo carniceros en un Walmart en Texas que querían sindicalizarse. La compañía respondió eliminando la carnicería y comenzó a vender carnes empaquetadas. Wong dijo que la cadena también ha ganado oposición debido a las inclinaciones políticas de la familia fundadora de la compañía, los Waltons. “Muchos de los herederos de Walmart contribuyen agresivamente las causas de la derecha,” Wong dijo. Steven Restivo, el director de asuntos comunitarios de Walmart, defendió la compañía diciendo que el sitio en Chinatown tiene muchos partidarios, incluyendo la comunidad empresarial Chino-Americano. “Basado en todo lo que ofrecemos, nuestros socios no parecen pensar que la membresía en un sindicado sería un mejor trato,” Restivo dijo en respuesta a las preguntas sobre los esfuerzos de la compañía a bloquear negociaciones colectivas. Restivo cuestionó las alegaciones que la compañía no ofrece beneficios médicos adecuados. Él dijo que más de 1 millón de empleados están bajo el plan de salud de la compañía que cuesta casi $15 por cada periodo de pago para una cobertura comprensiva. La compañía también ofrece igualar hasta 6 por ciento del salario de un empleado para las contribuciones de empleados al plan de jubilación 401(k). Además, la compañía también ofrece hasta 10 por ciento de descuentos en la mayoría de productos, dijo Restivo. “Nosotros tomamos mucho tiempo en comunicarnos con nuestros socios y la mayoría nos dicen que tienen una experiencia gratificante al trabajar en Walmart,” dijo Restivo. “Walmart es un comerciante que le preocupa su imagen y esta muy preocupado sobre cómo esta manifestación podría afectar a las instituciones públicas que tendrán que votar para aprobar algo como esto (en el futuro),” Shaiken dijo. El martes, dos grupos, Asian Pacific American Labor Alliance (APALA) y United Food and Commercial Workers Local 770, anunciaron que han presentado una demanda contra el Departamento de Construcción y Seguridad de la Ciudad de Los Ángeles por no informar al público de su decisión de permitir la apertura de la tienda Walmart en el Barrio Chino sin primero hacer un reporte sobre el impacto que la tienda tendrá sobre el medio ambiente. La demanda también busca detener la construcción en la tienda. El senador estatal Ron Calderón ha iniciado una discusión para crear una asociación entre una preparatoria de orientación profesional en Montebello y dos colegios cercanos. Ron Calderon representa el Distrito 30 del Senado. El pasado viernes, Calderón invitó a representantes de East Los Angeles College y Los Angeles Trade Technical College a visitar la preparatoria Applied Technology Center (ATC), una escuela con orientación profesional que abrió sus puertas el año pasado. Bajo la asociación, los alumnos de la preparatoria podrían visitar los colegios periódicamente y los instructores de estos colegios serían invitados a dar lecturas en ATC. Calderón espera que este esfuerzo podrá abrirles las puertas aún más oportunidades para los estudiantes de la preparatoria. Después de concluir la visita, los representantes de los colegios se pusieron de acuerdo que explorarán una serie de opciones incluyendo un intercambio de conocimientos técnicos, instructores, y equipo, según la oficina de Calderón. Alberto Hidalgo-Robert siempre fue “gordito”, pero cuando pasó de “llenito” a obeso y a pre-diabético, se lanzó en una lucha metódica contra la enfermedad que aflige tanto a niños como adultos en este país. 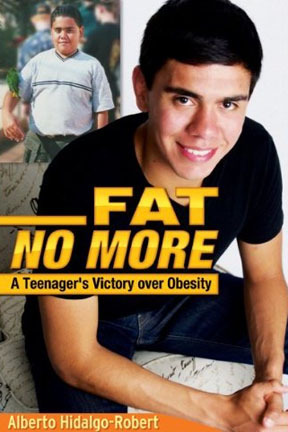 En su libro “Fat No More: A Teenager’s Victory Over Obesity” el joven salvadoreño relata los retos de su lucha personal, y ahora colectiva, contra la obesidad infantil. Publicado por el sello infantil y juvenil Piñata de la editorial Arte Público, el libro está dirigido al público joven. Escrito en un lenguaje coloquial y ameno, “Fat No More” detalla el sufrimiento de una niñez obsesionada con la comida y las muchas dietas restrictivas que terminaban por añadirle más kilos. “Mi vida se había convertido en un acto de circo y de comedia desde que tenía tres meses: ¡y ya era del tamaño de un niño de un año!” escribe. El libro “Fat No More: A Teenager’s Victory Over Obesity” esta disponible en inglés y cuenta con 184 páginas. Para el primer hijo, sobrino y nieto de la familia, su nacimiento fue de por sí un evento digno de celebración, visitas que por razones de su tamaño pronto lo convirtieron en una especie de exhibición. Hidalgo describe sus pies de bebé no como algo tierno y delicado, sino como gordos tamales,y sus manos, como dos pedazos de pan de pita relleno. Desde pequeño su mamá lo llamó “gordito” de cariño, pero otros familiares lo llamaban “Curly” como el más grueso de los tres chiflados. Nunca en tono de burla pero de diversión ligera, su familia lo consentía con comida, risa y adoración, como si fuera “un Buda bebé”. “Nadie parecía reconocer que mi ‘crecimiento’ temprano podría ser algo malo”, escribe. “Estaban tan preocupados por esconderlo, haciéndolo ver como algo lindo o gracioso, que se habían olvidado que podría resultar peligroso”. Escribe que la obesidad es como un hechizo que ciega a la gente, en especial a los padres que quieren complacer siempre a sus hijos, así sea con comidas “felices” para niños de 1.200 calorías. Hidalgo describe cómo aprendió a manipular a sus padres para conseguir lo que quería, comida alta en grasa y azúcar y de paso esas figuritas de juguete que venían con las comidas rápidas para niños. Al cumplir los once, Hidalgo se muda con su familia a California, donde reside desde entonces. El cambio no fue favorable para su condición, ya que en su nuevo entorno pasaba mucho tiempo solo frente a la televisión y con fácil acceso a la comida rápida. La señal de emergencia se encendió cuando Hidalgo tenía catorce años y había alcanzado un peso de 230 libras y un nivel de azúcar en la sangre que lo colocaba dentro del índice de la pre-diabetes. Esta fue la alarma que despertó al joven y a su familia y los motivó a buscar, con la ayuda de un médico especialista en obesidad infantil, un programa que le enseñara nuevos hábitos de por vida. En la segunda parte del libro, Hidalgo relata los retos del programa que, al no tratarse de una dieta, no prometía resultados inmediatos. A la larga, el joven logra cambiar sus hábitos alimenticios radicalmente y con ello su actitud hacia la vida. Hidalgo relata las diversas estrategias que aprendió del programa, cómo enfrentarse a situaciones difíciles para una persona adicta a la comida, cómo lidiar con familiares y personas acostumbradas a premiar con comida, y cómo preparar alimentos nutritivos y fáciles en casa. La publicación de este libro refleja la misión del sello Piñata de promover, mediante sus títulos recientes, los buenos hábitos de alimentación. Aunque el relato de seguro inspirará a jóvenes a tomar mejores decisiones alimenticias, la lectura resulta a menudo repetitiva, sobretodo en la primera parte donde las anécdotas sobre su pasado se extienden hasta casi cien páginas. La historia de un joven que triunfa sobre la obesidad mediante cambios saludables y duraderos, sin embargo, es una que merece atención inmediata, al proveer un modelo al lidiar con este problema tan contundente para las comunidades latinas del país.